"Five Key Principles of CPM"
"Five Key Principles of CPM" author Bob Paladino shares book royalties with the United Flight 93 Tower of Voices Memorial. It contains 40 wind chimes; sounds in the wind are a living memory of the 40 persons honored many of whose last contact was through their voices. To express your appreciation, please visit the Flight 93 National Memorial. Additionally, we'd like to thank our Amazon readers for all of the Five Star ratings! What do award-winning commercial, public, and nonprofit enterprises know that eludes most of today's executives? How do they organize and conduct themselves to accelerate and achieve outsized results? What core processes and best practices do they leverage? Learn the key principles of executing strategy from the executives directly in "Five Key Principles of Corporate Performance Management". "Five Key Principles presents guidance for the design, development, and implementation of a strategic planning and control system. Such a system leads toward better strategic decisions, competitive advantage, and increased profitability. Drawing on his profuse knowledge and extensive practical experience, Bob Paladino conveys a lively coverage of essential ideas and examples of ways to improve performance." organization to higher levels of performance." "Lots of organizations are measuring performance, but few succeed in effectively managing performance. This timely book contains time tested insight from leading companies and provides a 'how-to' guide for jumpstarting performance improvement initiatives in your organization." I am now chairman and majority shareholder of two international organizations; one in the multijurisdictional payroll arena and another in the aerospace industry and Bob is successfully transforming those companies into Strategy Focused Organizations. He is probably THE most knowledgeable and experienced individual in implementing the SFO approach to better organizational efficiency given his hands on experience and his considerable knowledge of accounting and finance as a CPA. " — Ted B. Miller, Jr.
"Bob Paladino has taken a balanced approach of taking all attributes of high performing businesses and turning them from theory to practical application. His book also discusses a step by step approach by using case studies which, if followed, will help organizations get to the maturity level in a timely manner". President Center for Advanced Management Institute (CAM-I)"
"Paladino [Bob] effectively leverages his considerable knowledge and experience as a management consultant and chief performance officer at Crown Castle to produce a compelling case for a Corporate Performance Management office. The CPM office becomes the focal point for translating strategic intent to operational actions. The concept is enriched by the book's excellent examples from both private and public sector organizations." "Bob Paladino's observations and principles are firmly rooted in the Kaplan/Norton Strategy Focused Organization (SFO) methodology. Bob is to be congratulated for his creative extension of these principles and for the illustrative cases provided. He has successfully walked the tightrope of theory and practice - a good read." "This book is emblematic of Bob's considerable expertise in organizing a company around the Strategy Focused Organization approach using the Balanced Scorecard Method. As founder, chairman and CEO of Crown Castle International (CCI:NYSE) I hired Bob as a consultant to lead a program to initiate CCI on the SFO method. He later joined CCI and led a successful organizational transformation to a much more efficient global platform in the telecommunications industry. "This book brings strategy to life through real-life application and provides the road map needed to truly unite a company in its objectives. Bob Paladino's method encourages team work, cross functional thinking and drives company success." Chief Operating Officer, Whataburger, Inc.
"All companies today are looking for sustainable competitive advantages - which are more difficult to achieve. Consistent execution in performance and defining the right metrics are critical steps to achieving them. This book provides excellent insights to get you started!" 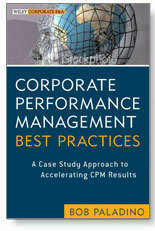 Buy your copy of "Five Key Principles of Corporate Performance Management" today! You can find the book on Amazon.